Really Useful Box details: Above is the box information for the Really Useful box range. This section states the internal and external dimensions for each size, as well as the box's weights in grams. 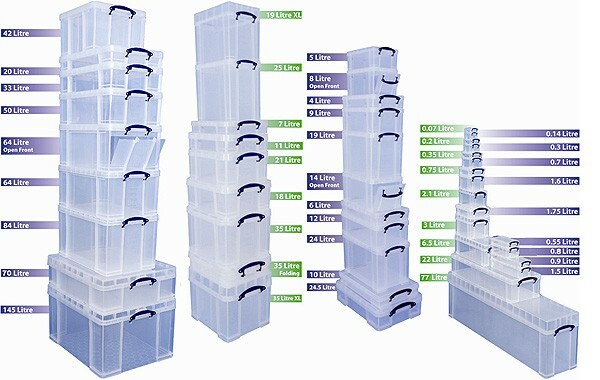 The image below shows how each box in the Really Useful range can be stacked for optimal storage. All Really Useful Boxes are manufactured using Polypropylene. All Really Useful products have a working temperature of -15°C to +80°C. Boxes are not made in a sterile environment, so they're therefore NOT 'food grade'. The polypropylene used to manufacturer Really Useful Boxes is however safe to store food and therefore the boxes are 'food safe'.